This is arguably one of the most divisive releases in Hawkwind's catalog. Let me lead off by saying that I land in the group of people really won over by it. That said, I get why some people don't like it. 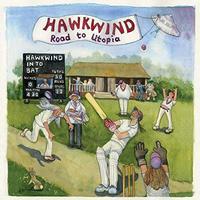 It's clearly not what you expect from a Hawkwind disc. Well, at least if you are versed mostly in the most well-known albums. When I heard that they were doing an album with an orchestra (and Eric Clapton guesting on a song), rerecording older Hawkwind sounds, I was interested, but a little hesitant. I mean, that concept is sort of overdone, and the results are often questionable. Sometimes the orchestra is well integrated, making it creative and exciting. Other times, though, it's just sort of icing on the old arrangements and seems gimmicky. No matter whether you like this album or not, I can't imagine anyone saying that Hawkwind took the easy route or followed either of those somewhat overdone approaches. They took these songs, deconstructed them to the most basic elements, and then rebuilt them in new ways. There are things like jazz, Island music, Latin horns and blues in the mix. Anyone who says Hawkwind hasn't experimented with that stuff in the past, hasn't paid close enough attention. While those things are rare in the catalog, if you dig deep enough you can find examples of this type of exploration from them. Here they've done it for a whole album. Personally, I think that it's quite effective and fun. Sure, it's unexpected, but who wants the same album recycled over and over again. Besides, there are enough Hawk-elements to make it recognizable. They bring this in with a stripped back approach. Latin horns lend a different flavor altogether. Yet, as the vocals join, it's full-on Hawkwind. They just seem to strip it back and a bit and take it into Spain. It's a weird twist, but it works and is still recognizable. They bring a bluesy grind to this Hawk classic. It comes complete with some killer piano work and harmonica. Somehow it suits the cut in a way you wouldn't expect. Eric Clapton guests, and his guitar is appropriate to this arrangement. The vocal sections bring it closer to the original, but this is like a deconstructed and then rebuilt version of the piece as far as I'm concerned. Turning this toward the balladic (it was always rather balladic, so they've just intensified that angle), they bring some intriguing strings and other flavors here. I think it really suits the song. The flute led interlude later brings a lot of magic, too. This is energized and so much fun. There is a real Island vibe to it. Yet, it has some surf music textures in the mix, too. It's clearly Hawkwind, though. It's bouncy and accessible. I dig the Spanish guitar on this, and the space elements that come over the top are trademark Hawkwind. Bringing an acoustic based arrangement to this lends an intriguing flavor to the piece. I dig the symphonic elements added to the mix as it builds outward later. The clean guitar soloing is tasty, too. 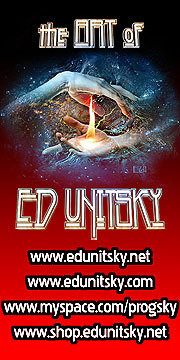 This is a guitar based instrumental with keyboards and other elements adding to the textures. Slow moving and quite psychedelic, this works really well. It's one of the most "Hawkwind-like" arrangements here. They turn it out to a rather jazzy interlude as this continues. This is acoustic guitar based and very pretty. The strings really add a lot to the arrangement. As you might guess, based on the title, this segues into the next tune. They bring the classic Hawkwind melodies, but the horns lend a real jazz angle to this thing. It's a killer tune and works so well in this format. Further down the road they power it out into more traditional Hawkwind sounds for an instrumental section. Sure, it's augmented by the orchestral, but it's also a classic, soaring space rock sound at its core. Around the five minute mark they bring it back to the song proper with more intensity and again the horns lend an intriguing flavor. After the cut peaks to end, there are some voices and such, which I think are from a movie. In fact, the one voice sounds like John Hurt to me. All in all, it's a great way to end this set in style.